Report or Comment About . . .
For births registered from 1907 to the present, complete the Washington State Certified Birth Certificate Application. Spanish version. This application is also available at the Clallam County Health & Human Services office. Certified birth certificates prior to 1907 must be ordered from the Washington State Center for Health Statistics. They may be ordered on-line or by calling 360-236-4313. Applications are also available at the Clallam County Health & Human Services office. For applications received Monday through Thursday, the birth certificate will be available for pick up at the Clallam County Health & Human Services office on Friday after 1:00 or can be mailed for a fee of $5.00 (per address). For applications received on Friday, the birth certificate will be ready the following Friday. For Washington State certified death certificates which are available for deaths occurring in Clallam County after June 2012, complete the Clallam County Certified Death Certificate Application. This application is also available at the Clallam County Health & Human Services office. Only death certificates that have been finalized by the Washington State Center for Health Statistics can be issued by our office. Certified death certificates from July 1, 1907 to June 2012 can be ordered through the Washington State Center for Health Statistics. For applications received Monday through Thursday, the death certificate will be available for pick up at the Clallam County Health & Human Services office on Friday after 1:00 or can be mailed for a fee of $5.00 (per address). For applications received on Friday, the death certificate will be ready the following Friday. Death certificates that have been filed electronically will always be available at the county level regardless of the county in which the death occurred. Certificates cost $20 each and are payable by cash (exact change required), check, or money order made out to Clallam County Health & Human Services (CCHHS). No credit/debit cards accepted. 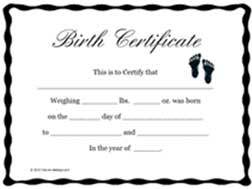 For an additional $10 (total of $30), birth certificates can be expedited and ready the next business day after 1:00. An application must be completed and the fee paid prior to issuance.